Woocommerce Products auction is a wonderful plugin that allows you to sell a product at an auction for your Woocommerce store. With the auction plugin, any buyer can place a bid for a specific product. Woocommerce auction plugin allows the buyer to purchase a product at the best price and allows the store owner to generate a profit bigger than expected. 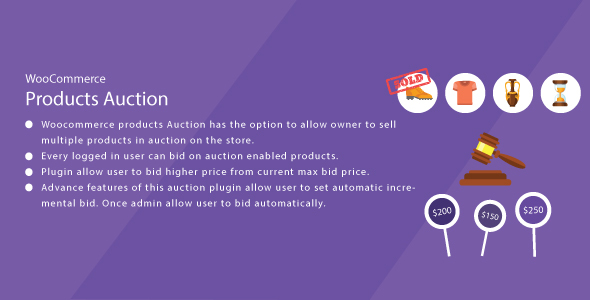 Auction plugin for Woocommerce has an option to incremental and automatic biding. Woocommerce products Auction has the option to allow owner to sell multiple products in auction on the store. Every logged in user can bid on auction enabled products. Logged in user can bid and see her max bid amount. This Woocommerce auction plugin allow user to bid higher price from current max bid price. This Woocommerce simple auction plugin has option to display all bids on the single product page in descending order. Advance features of this auction plugin allow user to set automatic incremental bid. Once admin allow user to bid automatically. User can set increment, min and max price for the bid. Once max bid price exceed then user will be notified via email. Woocommerce auction plugin will notify to winner once auction time is complete. Woocommerce auction plugin provide an option to admin to lock the product for the winner for a particular period of time. So only winner can purchase the product in that time period. If this option is disabled then anybody can purchase that product. Woocommerce auction plugin has option to set reserve price for the product. If last bid amount of auction is below the reserve price no one will won the auction. WordPress Woocommerce auction plugin has option to set start price of auction product. Auction plugin for Woocommerce has also option to set start time and end time of auction. Buyer can see their all auction bid list in dashboard area. On the single product page buyers will see countdown timer showing them exactly how much time remains before the auction over. You must learn every rules, tips and strategies just about any casino games you like to play. I really wanted to construct a simple note in order to say thanks to you for those precious pointers you are showing here. My extended internet investigation has now been rewarded with extremely good content to go over with my pals. I ‘d say that we site visitors are extremely blessed to exist in a wonderful community with very many awesome individuals with valuable guidelines. I feel extremely grateful to have discovered your entire web pages and look forward to really more pleasurable moments reading here. Thank you once more for a lot of things. One of the most complete list of crypto industry sources. The database contains 350k+ targeted URL records of cryptocurrency, blockchain, ICO/ITO/STO, fintech and related sources. This database is the best solution to attract targeted crypto audience. 24500+ keywords were used while scraping search engines results.